Studio portrait of 1900 Private Thomas Farrell, 59th Battalion who was a 36 year old weaver from Leichhardt, NSW when he enlisted and embarked for overseas with the 2nd Reinforcements from Melbourne on 4 May 1916 aboard HMAT Port Lincoln. 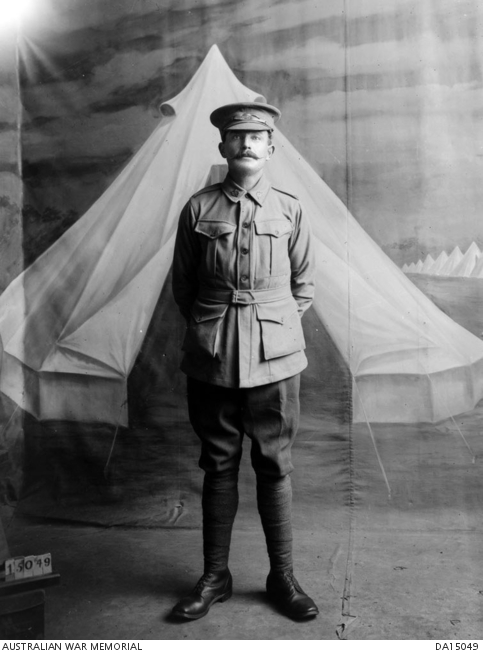 While serving in France with the 57th Battalion he was wounded and evacuated to England and then to Australia, arriving on 20 September 1918. This is one of a series of photographs taken by the Darge Photographic Company which had the concession to take photographs at the Broadmeadows and Seymour army camps during the First World War. In the 1930’s, the Australian War Memorial purchased the original glass negatives from Algernon Darge, along with the photographers’ notebooks. The notebooks contain brief details, usually a surname or unit name, for each negative. The names are transcribed as they appear in the notebooks.